12’W x 36’L x 12’H Regular Style RV Cover with One Side Closed and Extra Braces. 20’W x 41’L x 10’ H Vertical Roof Carport with Side Panels and Gable Ends. One of the most popular forms of travel used today is taking an RV cross-country! Travelling in an RV is an experience that not many people get to experience, and if you have, one that you don’t want to miss! In the 60’s and 70’s, vans were the way for a family or group of friends to travel in style and comfort; since then, RV manufacturers have built vehicles with more power, efficiency, and of course, comfort. An RV provides the comforts of home in a versatile vehicle that can be taken just about anywhere. There are plenty of parks and campgrounds across the U.S. to choose from, along with those in other countries if you’re ready for an adventure! If you have an RV or are considering purchasing one, Carport Central can help you keep it in top shape by building a custom metal RV carport for you. Investments such as RVs need to be protected from the elements, and our high-quality steel RV carports can do just that! Not only are our structures durable but are also fully customizable. 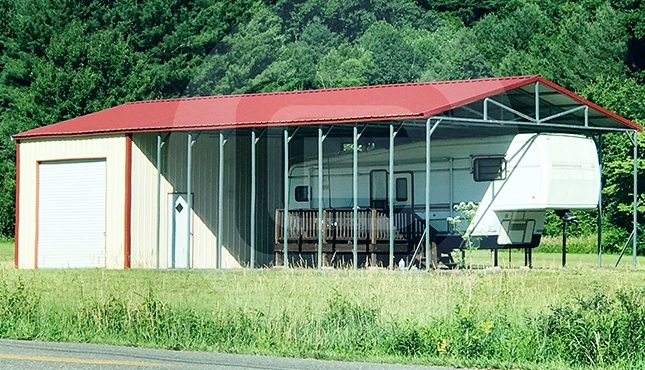 On all our custom RV carports we offer 12-gauge and 14-gauge steel, a variety of roof and side styles, and a wide range of colors. We realize RV’s aren’t “one size fits all,” so whatever specifications you may have, we can build your carport to suit them all. We have steel RV sheds for sale with available storage, so you can keep your valuables and camping utilities in a safe environment along with your motor vehicle. And with our one-year workmanship warranty on any carport, you can trust that your RV cover will be engineered with high-quality materials and the finest professional craftsmanship. 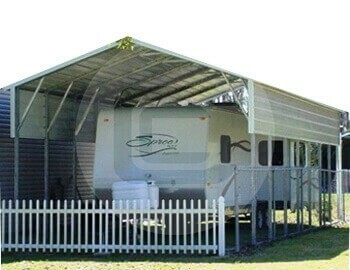 There are three types of RV carports – regular roof, a-frame roof, and vertical roof. We provide you with the choice of roof style and wall panel style, all depending on your personal preferences. You are also given the options of a roof-only carport, a carport with panels or a fully-enclosed garage. Your customization options range from the regular style roof (good) to boxed-eave style roof (better) to vertical style (best) that doesn’t allow anything to settle on your paneling. 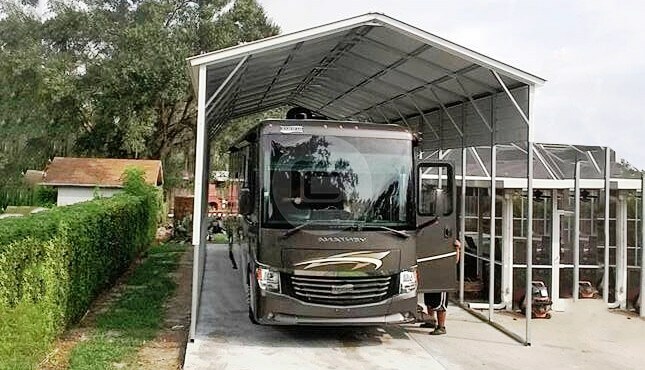 Our RV carports can be built starting at 12′ wide going up to 60’ wide; however, you need to keep in mind that your RV carport cannot be built taller than the width. 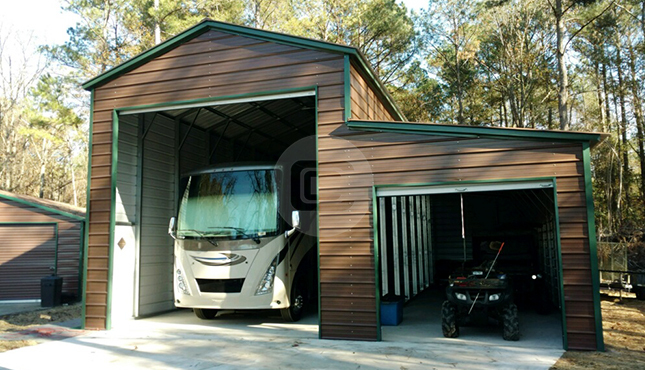 A motorhome carport can be turned into a garage easily by just adding walls and doors to the structure. Many of our customers who purchase an RV cover online prefer adding side panels to cover one side of the carport for protection from harsh elements. 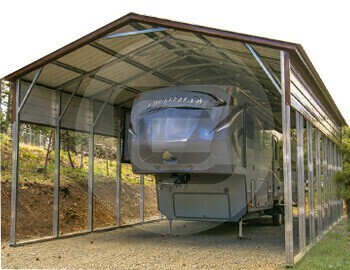 While an awning from the sides doesn’t fully enclose the carport like a metal garage, it does provide the space needed for maneuvering your RV. A fabric or vinyl tarp is better than nothing, but it’s still not an effective cover for your RV. It’s awkward and cumbersome to put on and take off, and it still leaves your RV exposed to the elements. And have you ever tried to remove a tarp that is covered with 6 inches of snow and ice? Not fun, and not easy. 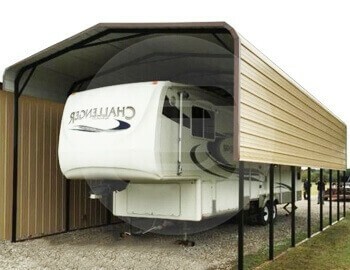 A better place to store your RV is under a covered metal carport (RV carport) with a solid surface. Better still, keep your RV both safe and secure inside a fully-enclosed metal garage! It’s easy to find a contractor for metal carports and buildings at discounted prices nowadays, all with a compromise on the quality of steel and material. 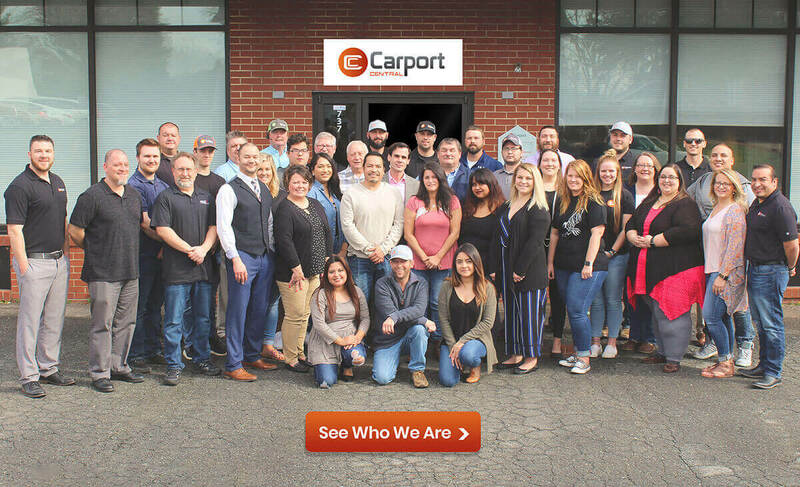 Here at Carport Central we understand when you’re buying an RV, you’re investing a lot of hard-earned money into the purchase. Therefore, we make sure to assure our customers of our partnership with top manufacturers who install the strongest metal buildings and have for years. Our carport prices vary based on the size and style you need; they are usually built with dimensions of 12’ – 30′ wide, 21′ – 51′ long and 12′- 20’ tall. And if you’re in need of more storage space, we can customize according to your needs and budget. The prices of RV carports also vary according to the area you live in; such as, if you live in an area that experiences heavy snowfall or high wind, you will require a stronger gauge and certified RV cover. Carport Central offers various metal RV carports and metal buildings for purchase online, delivery and installation free in 40 different states. The states with free setup of our various RV steel covers are Alabama AL, Arkansas AR, California CA, Colorado CO, District of Columbia DC, Florida FL, Georgia GA, Illinois IL, Indiana IN, Kansas KS, Kentucky KY, Louisiana LA, Maryland MD, Mississippi MS, Missouri MO, New Jersey NJ, New Mexico NM, New York NY, North Carolina NC, Ohio OH, Oklahoma OK, Pennsylvania PA, South Carolina SC, Tennessee TN, Texas TX, Virginia VA, and West Virginia WV among others! Great service. They delivered and installed on time. Great pricing. Finish your custom steel structure with something sturdy that can stand against the elements. All roof styles can be certified for structural integrity but finding the right type for your climate and need is important. We have a wide variety of metal buildings for sale with many customization options. You can call us today at (980)404-2872 to speak with one of our friendly building specialists to learn more about roof types and which best fits your needs.